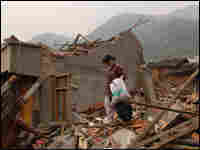 Chinese Earthquake Victims Still Anxious For Relief Six months after the devastating Chinese earthquake, disaster victims are struggling with unemployment and worries about the future. Members of one family are losing their optimistic outlook about help from the government, and their future seems to be on hold. Read Louisa Lim's report on Zhan Fulan and her family in the days immediately following the earthquake. In May, Zhan sorts through the pile of debris that used to be her family's home. Zhan stands in the place where her house used to be. In the seven weeks after the quake, the rubble was removed, tents erected and a road paved. 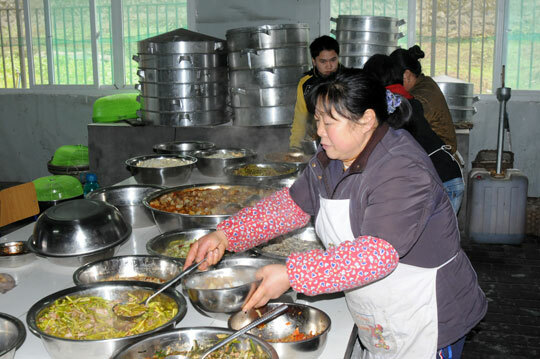 Six months after the earthquake, Zhan has found temporary work in a school kitchen. She and her husband have been unable to find permanent employment. Six months have passed since the devastating earthquake in China that left almost 88,000 people dead or missing and 5 million people without homes. As winter approaches, the disaster victims are struggling with unemployment and worries about the future. NPR's Louisa Lim has been tracking one family since the days just after the quake, and she recently met up with the family again. 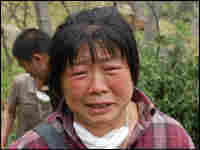 The first time I met Zhan Fulan, four days after the May 12 earthquake, she was burying her mother-in-law, Li Mingxiu. The 89-year-old woman died when the family house collapsed on her. "I couldn't save her," Zhan told me, tears streaming down her face as she watched her husband digging the grave. She was literally bowed over with grief, overwhelmed with the enormity of their loss. The family had also just buried a nephew and two nieces who died in the ruins of their school. Their house had been completely flattened. All that remained of it was an enormous pile of concrete, bricks and planks of wood — there was nothing that bore any resemblance to a family home. 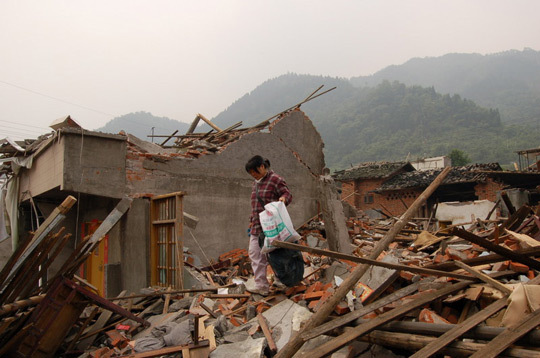 "I don't want to live here after this," Zhan said, as she scavenged through the devastation around her. "Our pigs and chickens were all buried. There's no work, and I'm scared of aftershocks." In July, seven weeks after the quake, I went back to Hongbai, near Shifang city, to track down Zhan in the prefab city that had sprung up there. When I found her, I could scarcely recognize the beaming woman who laughed as she clasped my hand. "I feel much better now," she said. "After my mother-in-law died, I was so sad, I couldn't speak." Walking along the street where Zhan's house used to be, the difference was extraordinary. In barely seven weeks, the piles of debris had been completely cleared away and the area leveled. It was now populated with tents donated by the Korean International Cooperation Agency. Where once there had been makeshift tents cobbled together from plastic sheeting and planks of wood pulled from the rubble, now there were tidy rows of blue-roofed prefabs, housing some 2,000 people. Zhan had already been assigned a prefab to share with her husband and 26-year-old son, Ma Jian. She was relieved — and proud — as she pointed out the bed, quilts and wardrobe. "Everything was given to us by other people," she said, smiling. "We didn't have a thing." As the displaced residents cleaned their new houses, there was a sense of optimism and even excitement, as well as gratitude to the government for organizing the shelters over their heads. Six months after the quake, I returned to find Zhan once more. It was morning exercise time at the prefab school, and I'd been told she'd found work in the kitchen there. When I found her, she still looked cheerful. But life hasn't been easy. Zhan was only filling in for someone who was sick. 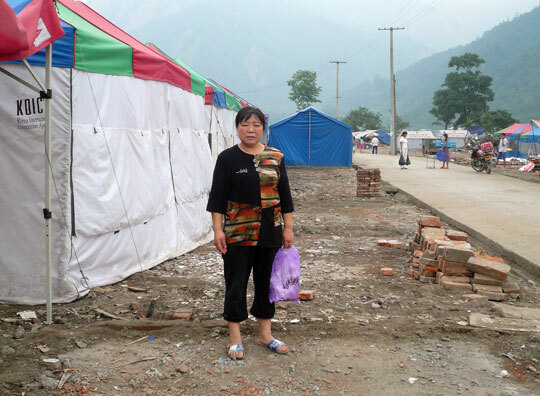 She and her husband remain unemployed, like an estimated 80 percent of the disaster victims. For the first three months they lived off government handouts, and since then, the couple has depended on their son, who — like many others his age — has gone to a nearby city to look for a job. Family relations have been strained by circumstances, and the future seems to have been put on hold. "Our son doesn't come back much," Zhan says. "There's no space for him in the prefab. He can't find a girlfriend or think about marriage as there's nowhere for them to live." At the school, the students line up clutching their lunch bowls. Almost one-quarter of the town's schoolchildren died in the quake, and the community is still wrestling with grief, trauma and the stress of losing their homes and everything they've ever worked for. "The quake has changed our characters," Zhan says. "My husband gets angry easily, and so do I. But that change is happening behind closed doors, not in the open." As she washes dishes, it is clear that reality has set in. It was bitterly cold already, and although the local government has given out electric blankets and heaters, the flimsy prefabs will provide little warmth once snow starts falling. Reconstruction hasn't yet started here — though the government has pledged to spend $440 billion on building. Everyone is waiting for the plans for the new town to be unveiled. They don't know when new houses will be built — or how they will pay for them. Zhan's land was requisitioned — it was used for prefabs — and the family hasn't received any compensation yet. "It's said the government received donations of money from many different places for disaster victims, but I don't know where that money's gone," she says, as her colleagues mutter in agreement. Throughout these months, the disaster victims' mantra has remained the same: "We're waiting to see what the government will do for us." Those words, once full of hope and confidence, are now repeated with mounting worry and desperation.